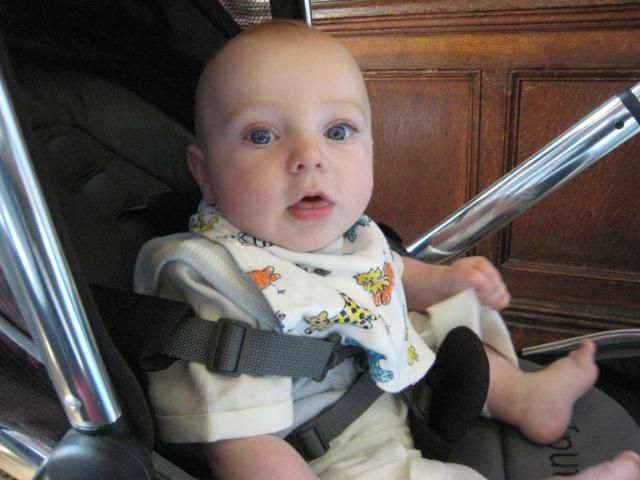 It was Hugo's christening yesterday, which gives me an excuse to post a couple of pictures of both the little fellow and the church and surroundings of the Temple in London. Nowadays, the Temple is best known as the collective noun for the Inner Temple and Middle Temple, two of England's four "Inns of Court" which, in practical terms, are collections of lawyers (specifically, barristers rather than solicitors). 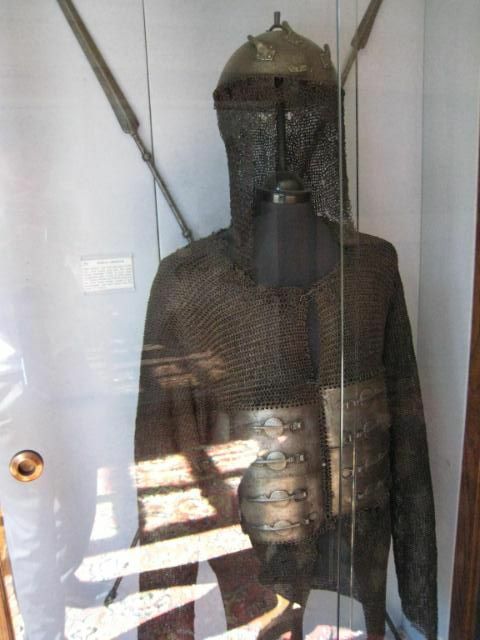 Lawyers set up shop in the area early in the 14th century, but the Temple began life as the English headquarters of the Knights Templar. 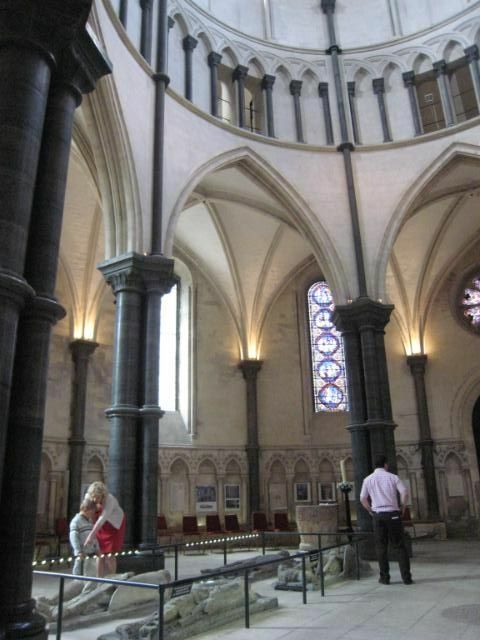 Temple Church was consecrated in 1185 by Heraclius, Patriarch of Jerusalem in the presence of Henry II. The "Round Church", to which the rectangular Chancel was added some years later, was designed to be a replica of the Church of the Holy Sepulcre in Jerusalem. It was in the Round that Hugo was baptised and the church's Master (the priest of the church still bears the title of the head of the military order) explained how difficult it is for us today to imagine how people in the 12th century would have felt being in a near-replica of the place where Jesus was buried - it was the closest to being in Jerusalem that many would ever achieve. 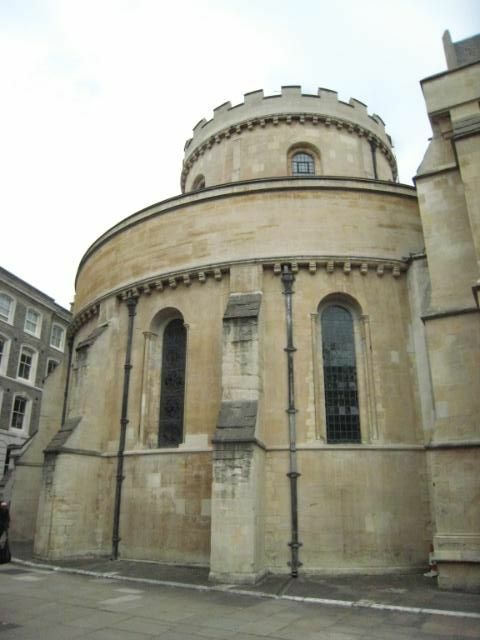 When the Templers fell in 1307 the Church and its adjoining monastic buildings were appropriated by King Edward II who then handed the Temple over to the Knights Hospitaller. The Hospitallers in turn rented out some of the area to the lawyers whose successors have remained ever since. 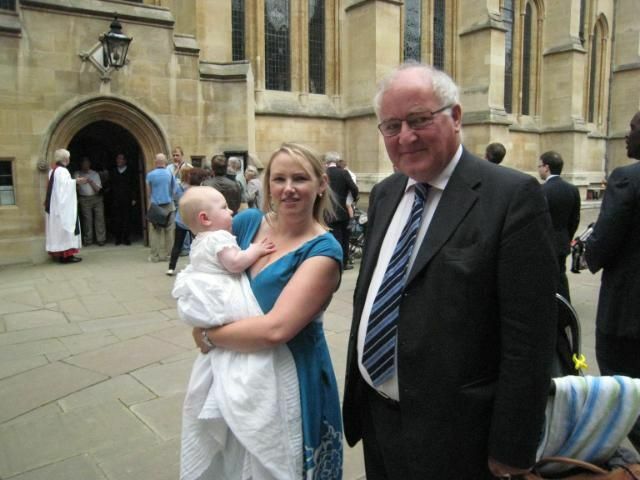 After the christening we stayed for the service of mattins and then held a reception for our guests in the rooms of Middle Temple Hall. The Hall was built between 1562 and 1573. 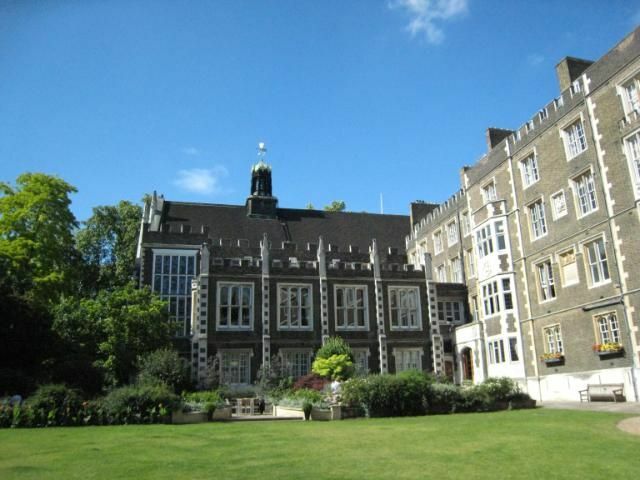 It hosted the first performance of Shakespeare's "Twelfth Night" in 1602 and provides the dining rooms for members of the Middle Temple. 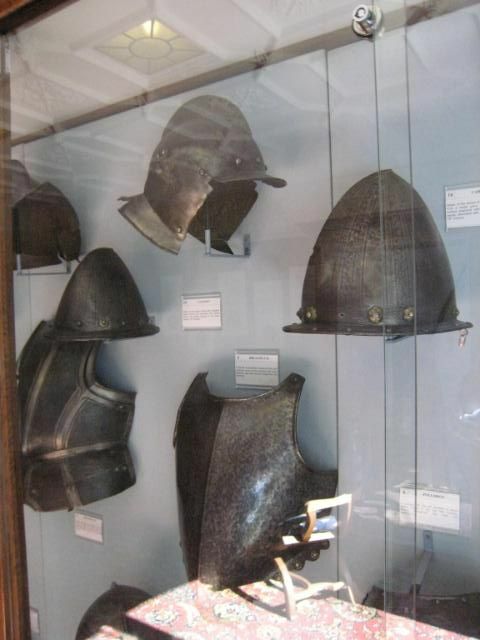 After lunch we went out into the gardens to enjoy the sunshine and I found some displays of renaissance arms and armour at the foot of the main staircase. On the painting front, I'm pleased to say that the Carlists are finally finished and going through the basing process. The 108th Ligne has 5 companies completed and should be finished this week. Not sure what to do next - perhaps some French artillery. I'm feeling a bit of an itch to paint some more AWI British line, although that would necessitate an order to Messrs Perry. Apologies for the lack of post of late. Work and Hugo have both intervened heavily to prevent painting, and whilst I do have some photos of recent stuff I am not satisfied with them and need to take some more. 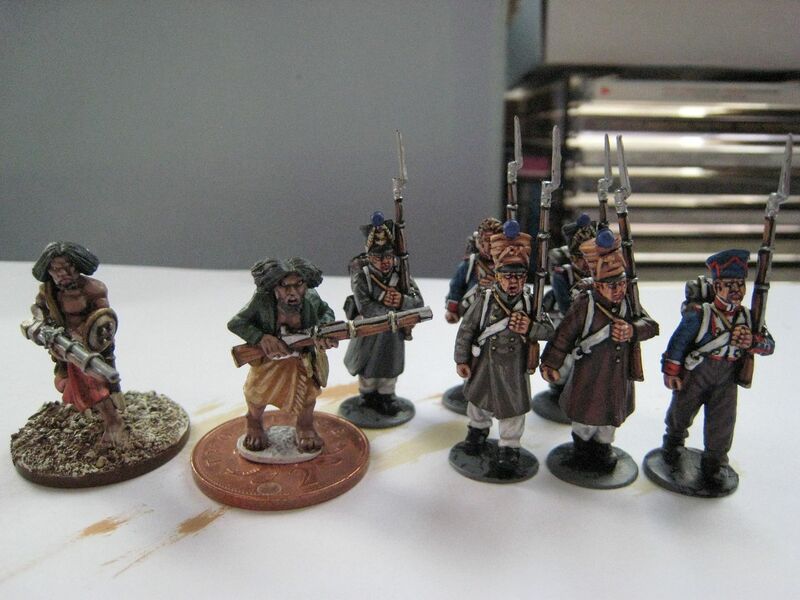 Here are a couple of pics of what I am working on - Carlist infantry and French 1815 infantry. I find that sometimes I suddenly experience a burning desire to do something and last weekend I decided I wanted to paint more Napoleonic infantry. I have no idea where this came from, but when this sort of thing happens you just have to go with it....Perhaps at the back of my mind was the realisation that now there is a plastics pile alongside my leadpile and that I need to begin to seriously grapple with both. Perhaps I just fancied a change of scene. Production has certainly picked up as I painted the 6 French figures above in 5 days and should have the grenadier company finished by the end of the weekend - this will be the first time since Hugo was born that I have returned to my old 12 figures a week pace! I'm sure that much of the reason for that is the quality of the Perry plastic figures; as I've said before, they almost paint themselves. 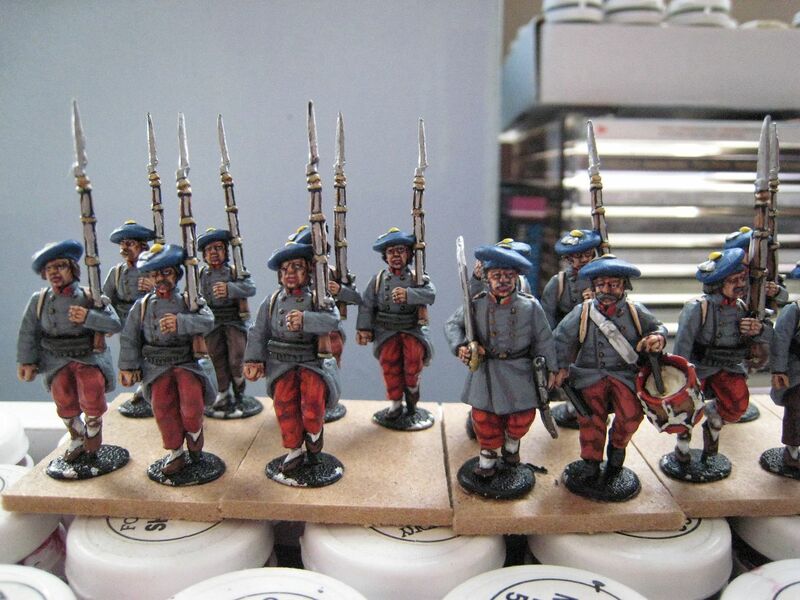 As the Carlists and Frenchies are in quite large units I will not have them finished for another week or so. I'm tempted to mount another Fourth of July parade tomorrow if I can find some time in the garden - perhaps early war Americans or even a review of my Isabelino force for the First Carlist War. Other bloggers have noted the sad death of Paddy Griffith a couple of weeks ago. I met Paddy a few times because he was my brother's godfather. Our families lost regular touch over the years, but I have fond memories of Paddy visiting us with his family when my brother and I were young. His gifts to my brother and I were always of a military nature, and I recall him umpiring a chariot race game on the living room carpet using some plastic Roman chariots that he had given us. I was fortunate that Paddy's realisation that I was far more interested in military history than my brother led to the occasional gift of a signed book. From what others have written, such generosity was very typical of Paddy. My schooling also benefited from his perceptive analysis of military history. I once asked him why the French lost at Waterloo. Expecting (and hoping for) a detailed exposition of the battle he said "it's simple - our men were better than theirs". I used that line when asked the same question at my secondary school interview a year or so later; it prompted a laugh and I like to think helped me secure my place. He was a lovely man and will be much missed.